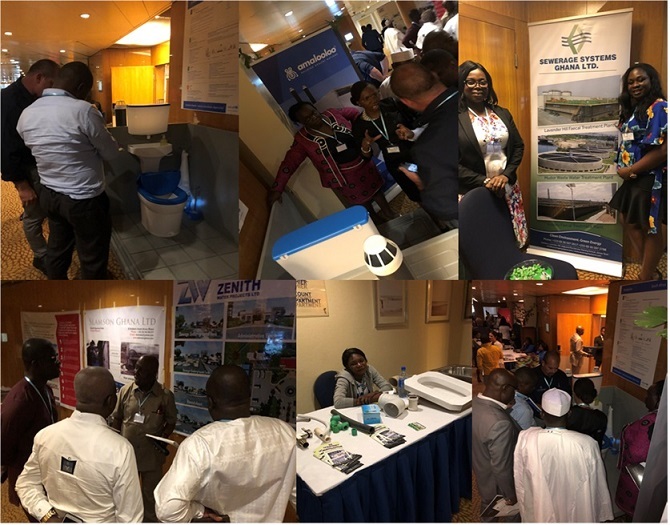 Last November UNICEF’s West and Central Africa Regional Office, Supply Division and WASH Programme Division convened a regional sanitation industry consultation in Abuja, Nigeria. The consultation brought together 100+ representatives from industry, financial institutions, governments and development partners. 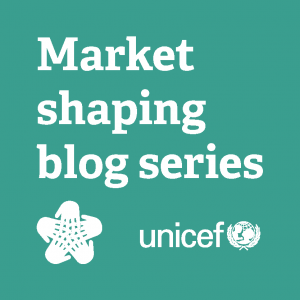 This series of three blogs is based on the discussions held on market shaping – including the current thinking, how it can increase uptake of improved sanitation facilities amongst the poorest households, and how it is being considered at the country level. The series is being released in the run up to AfricaSan 5 where the African sanitation community will come together to assess progress against the Ngor commitments on Sanitation and Hygiene. It is hoped that these discussions can be continued there. A UNICEF/USAID convened side-session will be held on February 22nd on Market-based Rural Sanitation which you can sign up to here. Progress needs to be accelerated 3x the current rate of change to end open defecation by 2020 (1). As of 2015, 2.3 billion people lacked access to a basic level of sanitation services – defined as a non-shared, improved sanitation facility (2). This provides an enormous business opportunity for the private sector to supply improved sanitation facilities. In the West and Central Africa region alone, there are 351 million potential users of improved sanitation facilities who have yet to be reached (3). Along with other partners, UNICEF is rising to the challenge, recognizing the need to expand market-based approaches to sanitation to fulfil the SDG ambition to improve the quality and sustainability of services. This area of attention complements UNICEF’s continued focus on community-based approaches that create demand for sanitation, as outlined in UNICEF’s Strategy for WASH (2016-2030). As a first step, UNICEF launched a market shaping strategy describing one of UNICEF’s approaches to creating healthy and sustainable local sanitation markets. Market shaping focuses primarily (but not entirely) on strengthening the business environment for sanitation enterprises to scale, by addressing issues of government policy, availability of financial services and raw materials, and business development services for enterprises, among others. A better business environment has potential to increase the scale of private sector engagement in sanitation by increasing market participation and accelerating transactions between sanitation enterprises and families who want better toilets (5). Similarly, laws and regulations that make it easier to do business, easily accessed public information about the sanitation market, and further-reaching supply chains for sanitation related commodities can also enable people to improve the quality of their services. This in turn can create incentives for existing and new enterprises to deliver appropriate and affordable sanitation products and services to people who need them. This wider focus on strengthening the business environment complements sanitation marketing, which often looks to strengthen the core sanitation market – the sanitation businesses, the entrepreneurs themselves and the target consumers. 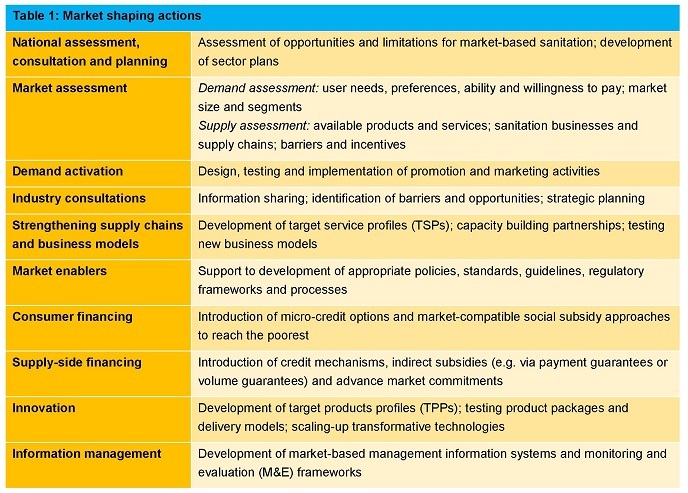 Market shaping strengthens sanitation market systems through various actions, applied as appropriate based on the context (see table 1). These actions were developed through consultation with market-based sanitation experts, as well as UNICEF’s previous experience in shaping markets in other sectors such as health (e.g. for drugs and vaccines). However, distinct differences exist between sanitation markets and other markets, specifically in relation to the consumers, the product and the market characteristics. These key differences must be taken into account when engaging in market shaping actions. Diagnosing barriers in the business environment is a critical first step towards understanding the market shaping actions that might be appropriate for a specific business context. Within UNICEF, the West and Central Africa Regional Office took the lead by commissioning a sanitation market assessment in Ghana, Nigeria and Cote d’Ivoire. Information sharing and collaborative planning is as critical for market-based approaches as it is for community-led approaches to sanitation. To validate the market assessment, UNICEF convened a three-day sanitation industry consultation (see report here), bringing together over 100 participants from governments, development agencies, academia, and around 30 private companies from the region and abroad. The participants built on the assessment by identifying additional barriers and opportunities for private sector engagement in sanitation. 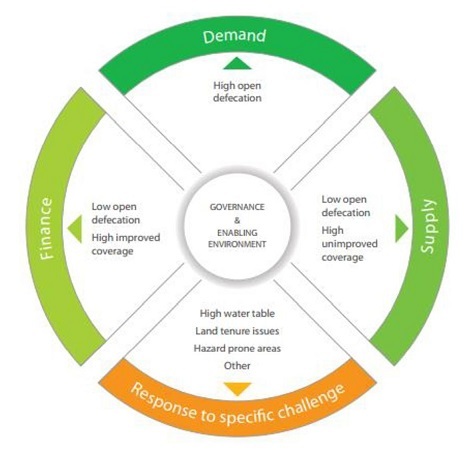 Increasing consumer financing options for affordability and to create incentives to prioritise the purchase of sanitation products and services. The industry consultation concluded by identifying priority actions for shaping sanitation markets, to be followed by national consultation and planning in the three participating countries. These countries will serve as learning laboratories for shaping healthy sanitation markets in the region. Market based sanitation alone will not reach everyone. Community-based approaches remain central to the fulfilment of the human right to water and sanitation, and to the achievement of the SDGs. Similarly, governments, as duty bearers, have accountability to facilitate or directly provide these services. These actors – users, service providers, and governments – form the accountability triangle for sanitation, just like for water services. Even within the market system, regulation can create safeguards and incentives to ensure the poorest of the poor access improved sanitation facilities. Market-based sanitation combined with financing options for households such as loans, instalment payments, or targeted, so-called ‘smart’ subsidies that don’t distort the market could be one approach to address this (see forthcoming Blog 2 for Nigeria’s experience on combining financing with market-based sanitation). In its Strategy for WASH, UNICEF promotes a mix of context specific approaches in its sanitation programming. This includes elements of demand creation, supply development (of which market shaping is a part of), and financing options. More details on this approach to context-specific programming can be found in the forthcoming Blog 3 of this series on sanitation markets, and at the Pre-AfricaSan IDS learning and sharing workshop on February 17th. UNICEF is also convening a side-session on market-based rural sanitation at AfricaSan 5 on February 22nd with USAID under the WASH Partnerships for Learning and Sustainability (WASHPaLS) project and the Bill and Melinda Gates Foundation. We hope you can join us for these events and continue the discussion! 3. WHO/UNICEF. A snapshot of Drinking Water, Sanitation and Hygiene in the UNICEF West and Central Africa Region. Geneva: WHO and UNICEF; 2017. This blog post was written by Jolly Ann Maulit (UNICEF West and Central Africa Regional Office WASH Specialist), with contributions from UNICEF’s WASH Programme Division (New York) and UNICEF’s Supply Division (Copenhagen), including from Brooke Yamakoshi, Alain Giovanni Dusabe, and Constance Tourtois.